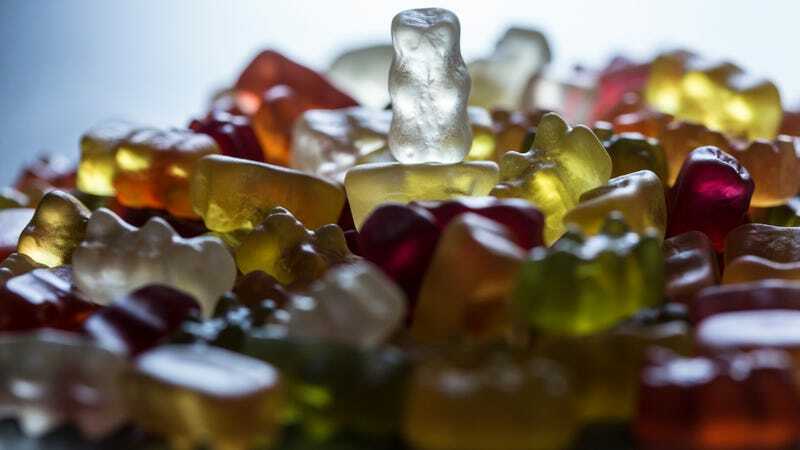 In the candy-filled newsroom over at public radio affiliate WFPL in Louisville, Kentucky, the delivery of a giant bag of gummy bears brought up a conversation about the relationship between color and taste. The staff puzzled over the individual flavors of each differently colored gummy, even undergoing a blind taste test to see if they could correctly identify the fruit flavors without a color to guide them. Without seeing the color, id’ing the flavor was a lot more difficult. We were so aghast by this statement dissing the tasting of the rainbow, that we did an immediate, non-scientific taste test in the kitchen of Onion, Inc., asking various staffers to blind taste-test Skittles. Our extremely small sample was primarily able to discern the correct flavors, or if they missed, usually came close (mistaking orange for lemon, for example: blame the closely related citrus family). Then, we even rinsed the Skittles clear of their color coating (which was a little bananas, we admit) to hopefully remove any excessive, flavor-enhancing fragrance; our testers still guessed correctly. So either we have a few Skittles savants on staff, or we’re not sure what this Katz guy was on about. Stevens went on to contact Haribo, makers of the vaunted gummy bears, and got an email back from a marketing VP, who stated: “I can definitely tell you that the HARIBO Gold-Bears gummy bear products in the U.S. contain 5 distinct flavors: Strawberry, Lemon, Orange, Pineapple and Raspberry.” This apparently makes the flavor of the green bear “strawberry”. Although we apparently could have discovered this by checking out the gummy bear page on Wikipedia, our minds are appropriately blown regardless. "Alexa, order gravy-flavored candy canes."